There was a rock station yesterday giving away a free divorce for Valentine’s Day and Planned Parenthood encouragesabortions for Valentine’s Day, or as the President said in support of abortion, no woman should be punished for having a child. The morning after Valentine’s Day might include the “morning after” pill to stop gestation, or ‘freedom’ from one’s spouse by yet another divorce or a stranger in bed after a “hook-up”. What has become of love and marriage, or is it marriage and then love? For a solid reflection on that question read Chad Bird’s article in The Federalist, “Giving Away a Divorce on Valentine’s Day”. Valentine’s Day is a far cry from the little known Saint Valentine. Someone wrote a graffiti, “Love is Enough” and another person wrote, “No, it’s not”…especially the way “love” is understood these days as only lust. The Gospel lesson for tomorrow, the 6th Sunday after Epiphany, includes Matthew 5:26-28. Jesus goes to the heart, the will. As the country lyric has it correctly about himself and us all: “I’ve looked for love in all the wrong places”. There is only person and place to look for the meaning of love and His Name is Jesus Christ and the place is His Cross. Luther’s Seal may be the best Valentine’s Day card: His Cross in our hearts killing sin, hence, black, but making our hearts alive and beating. Love for loveless shown. Luther also wrote that ring around it is gold, the color of heaven, but it is also the color of a wedding ring, complete with the purity of a white rose. He can make the foulest clean. Hear His Word and receive His Sacrament tomorrow on the Lord’s Day. A blessed morning after Valentine’s Day! The titles of these psalms is from the Latin Vulgate translation and reflect an old tradition of naming a psalm after the first word in the song: 1. Magnify; 2. Blessed; 3. Glory in God in the highest; 4. Now depart. All of these songs have been included in either the Prayer offices of the Church and/or the Divine Service. How do we know salvation and the Lord who is our Savior: Answer: “by the forgiveness of our sins” The Benedictus is the song sung every day in Matins. As John paved the way for the coming of Jesus the Christ, so by the Lord’s promise fulfilled to Zechariah, we each and every day in prayer, in the Benedictus, prepare our selves for the work of the Messiah in our vocations, and we too are “improbable servants”. Matins is good way to begin the day. God the Father Almighty, maker of all things, You looked on the affliction of Your barren servant Hannah and did not forget her but answered her prayers with the gift of a son. So hear our supplications and petitions and fill our emptiness, granting us trust in Your provision, so that we, like Hannah, might render unto You all thankfulness and praise, and delight in the miraculous birth of Your Son, Jesus Christ, who lives and reigns with You and the Holy Spirit, one God, now and forever. Reflection: In high school (I graduated in ’72), I was the president of the social science club (I was a class-A nerd!) and the club went to hear Dr. Paul Ehrlich speak at the University of Wisconsin-Milwaukee on his huge best seller Population Bomb in which he argued Malthusian horrors of overpopulation, decreased productivity and rising prices resulted in a global crisis bar none. His book has been reprinted 20 times. None of his predictions came true. Just think how many ‘scientific’ doomsday scenarios grip the public media. He argued for ZPG: zero population growth, that is replacement breeding, 2 or less children. I even remember in high school being relieved it was only my sister and I in our family. This thinking has permeated Western civilization to the point Biblical scholars debunk the Lord’s imperatives to be fruitful and multiple in Genesis 1. 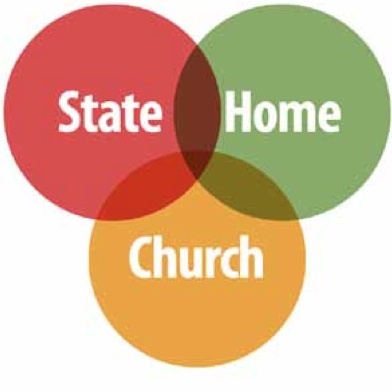 When in a liberal Lutheran church body (Evangelical Lutheran Church in America)I heard in an evangelism presentation that we can not count on families (or what’s left of them) filling the church. Such a ‘tactic’ was derided as “bedroom evangelism”. I thought of these terrible reminiscences in reading in Hannah’s brief bio above about her “bitter barrenness”. “Bitter barrenness” surely described Hannah’s soulful plight and ours as well. When Elizabeth was greeted by her kinswoman Mary, she exclaimed blessed is the “fruit of your womb”. The Visitation is sheer joy. We want wombs no longer fruitful. We want barrenness, bitter barrenness as a way to ‘solve our problems’, but it has not. ZPG in Europe will result in the demise of those once Christian populations, but it also is a cause of the demise of life and joy. Pro-life is more than no abortion. Pro-life means children. Our solutions to problems both actual and perceived become even greater problems. In Hannah’s bitter barrenness, she prayed. The Lord answered her prayer and she conceived and named her son Samuel, literally God hears. There was good news in the bedroom of Hannah and Elkanah and in the bedroom of Joseph and Mary. We must take the Lord at His Word of promise to be fruitful because on this Labor Day (9/1/13), parenthood is the highest vocation in creation which is blessed by the Lord with His Word in the 4th Commandment: Honor your father and your mother. No children means no honor. We live in a shameful age. Christians must be as Hannah and be Samuel, trusting in the Lord: He hears. Reflection: Monica’s husband was an adulterer. She stayed with him. She was faithful. She probably took literally the Epistle reading: Ephesians 5:21-23. She wanted her husband to be her head…but in Christ Jesus. She is not the model in our day of the liberated woman! Thank, God. Her strength was her Lord and she prayed for the conversion of both her husband and their son. I am not saying that a wife in an abusive marriage should stay. Monica was not physically abused. She was, though, spiritually and emotionally hurt by her feckless husband and faithless son. She persisted in prayer for them. Both were baptized. Her son became one of the most important theologians and pastors whose writings influenced one young monk in the Order of St. Augustine: Martin Luther. Augustine’s feast day is tomorrow. Freedom in Christ is praying for someone who may not even want your prayers. I think the Roman Catholic problem with Mary is that they make much too much of her which has no Scriptural warrant. I think the Lutheran problem with Mary has been we make much too little of her importance which likewise has no Scriptural warrant. We should not pray to her and neither should we think we have prayed her away. The Scripture records what she prayed: “My soul doth magnifies the Lord.” What or who do we magnify in our lives? I find my own question embarrassing to answer. Think of what the world magnifies: fame, wealth, power and in our day and time, the temple of the self, that is , my feelings, my goodness, my friends, ad nauseam, and I have wanted it all. Not Mary. For instance: Mary did not “shop till she dropped”. Her Son was not a choice but her Child. She loved her Son. She magnified the Lord. She magnified, made big in her life God’s grace to her in bearing the Only-Begotten Son of God. She bore her Savior and yours. This self-determination has culminated in licit abortion on demand as deadly self-fulfillment. And Mary brought the Life of the world into the world. Truly, she is counter-cultural. Mary is the model of the godly life in Christ Jesus for women…and men! Just as she told the servants at the Cana wedding, “Do whatever He tells you” (John 2: 5), goes for us servants as well. Lord, still our hearts and minds in the Sabbath of Your forgiveness by which You have redeemed us from the old way of death to live and breath in Your life, Your life which You first gave to Your Mother, so that this dark world may know You have come into our world for us and for our salvation and believing be saved. As Mary. Amen. Nathan said this after a story of adultery, murder, lies, deception and betrayal by King David, God’s man. David saw a beautiful woman while he strolled on the roof of his palace. He sent for her and they lay together. So seemingly harmless, a little midafternoon enjoyment, except both David and Bathsheba were already married but not to each other. What could it hurt? Like a certain fruit in Eden, “…it was a delight to the eyes”. Eventually Bathsheba sends word, I’m pregnant. Her husband Uriah the Hittite is fighting for the armies of the Lord under King David. David concocts a simple scheme: he gives a gives a furlough to Uriah to go home to his wife in the middle of battle, so he can make love to his wife. The scheme is transparent: Uriah will think he is the father. Uriah refuses because as an honorable soldier he tells the King he cannot leave his men, and so sleeps outside the palace, and does not go home. Then David invites Uriah to the palace, let him party and drink, get drunk so he goes down to make love with his wife. But he refuses again because of solidarity with his men. When Uriah refused the second time, David has another simple, but this time deadly scheme. David tells one of his generals to put Uriah on the front lines where the fighting is the heaviest. It works: Uriah is killed in battle. Now that solves the problem…maybe for David, for the moment, as men and women will think, but it does not solve the problem. The Lord’s solution is David’s salvation. David groaned under the weight of what he did. The Lord’s hand was heavy upon him. I think the cover-up is as worse as the trespass because one trespass is compounded with lies. David could not cover up any longer. He confessed. He knew he did wrong before Nathan ever came. Everyone does but in the preaching of God’s word of Law and Promise, David could get it out, into the open: confess. There is a suffocating selfishness in man that only the Holy Spirit can ventilate. The rich man slaughtered the poor man’s lamb for his appetite and his table, as David slaughtered the poor man for his bed. The Lamb of God, the best, was slaughtered for our appetites for what is not ours, for what cannot fill the heart, for what we covet and cannot nor should not have. You are that man. We are that man. He is the God who bore our weight of wrong upon His body and soul, the sinless one in the sinners’ stead. The woman who came washing Jesus’ feet was declared a sinner by Jesus’ host the Pharisee, Simon. “If you knew what kind of woman is touching you…” Jesus knew and so did the woman. Simon was not telling them anything they did not know: Jesus knew as He is true God, the woman knew by God’s true law. She knew for a long time. But now she confessed it with her love for Jesus as He fully and freely forgave her. She knew the hammer of the Law and in Christ Jesus she had heard the depth of God’s forgiveness in Christ. Still to be heard in the future at this time was the hammer of the nails into His hands. Simon was telling them something about himself: he looked down on her. He was not like her…but he was. He did not welcome Jesus. He gave Him no kiss. He did not wash His feet. He was above it all, he loved little because maybe Simon thought he was without sin. When we think we have no sin, we deceive ourselves and the truth is not in us, but when we confess our sins, God who is faithful and just will forgive our sins and cleanse us from all unrighteousness (1 John 1). Jesus physically looked down on her but He did not look down upon her. He came to lift her up out of her transgression, freed. You are that woman. We are that woman, His bride the Church. Christ loved the church and gave himself up for her,26that he might sanctify her, having cleansed her by the washing of water with the word…He takes care us His bride. He has, He will. The woman washing His feet with her hair is rather extravagant, out there, extreme, but so is His forgiveness, as extravagant, out there, extreme is the Cross to cover sin and death in His blood; because sin is extreme and out there. He made us His saints, faith holding Christ from head to toe. We have no land but until the Day our souls are His holy land to protect with His Word as He covers us in His Sacraments and Word. “…the Bible is not a record of the blessed good, but rather the blessed bad. That’s not a typo. The Bible is a record of the blessed bad. The Bible is not a witness to the best people making it up to God; it’s a witness to God making it down to the worst people. Far from being a book full of moral heroes to emulate, what we discover is that the so-called heroes in the Bible are not really heroes at all. They fall and fail, they make huge mistakes, they get afraid, their selfish, deceptive, egotistical, and unreliable. The Bible is one long story of God meeting our rebellion with his rescue; our sin with his salvation; our failure with his favor; our guilt with his grace; our badness with his goodness. As we heard in the lessons today: the woman at the feet of Jesus, King David, Paul…all crucified in Christ, raised to be with Him, dwell in Him. Confession and absolution is key, the office of the keys of His reign, to free those in imprisoned, to lock out transgression in confession and absolution. His absolution, forgiveness is absolute. It comes in two forms: public rite and private rite. With one another as His saints who sin we can confess and forgive. Here in the penitential rite and sometimes with a pastor. The Lord has given us this key. And when temptation comes a calling, don’t answer? No answer with prayer, Lead us not into temptation but deliver us from evil. You are the man. You are the woman. In Christ Jesus all that changes. You are His man. You are His woman. Faith holds Him head to toe, crucified and lifted us up in the Name of the Father and of the Son and of the Holy Spirit.